H/I brings you the right microtome for every job. The EDGE Series Microtomes embody the most modern sectioning technology. From routine histology to research applications and materials R & D, H/I Microtomes will provide you with the quality and performance you need. Auto-retracting microtome with motorized feed. Manually operated cutting mechanism. High-speed motorized unit for paraffin and plastic embedded specimens. Motorized cutting mechanism and feed system. 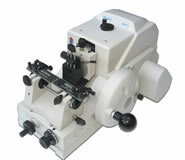 Easy to use rotary, retracting microtome with a wide range of options. 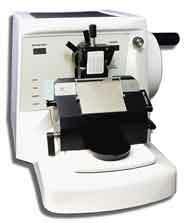 The 5040 microtome series is suitable for routine pathology, teaching laboratories and research. Other applications include materials research and food science. The rigid design is well suited for cutting hard specimens such as undecalicified bone and acrylic resins. Available in motorized and manual versions, 5040's strong, rigid and virtually maintenance free design will give years of reliable service. 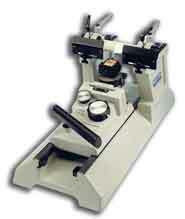 Extremely user friendly, the H/I Sliding Microtome requires minimal operator skills. Cuts a wide range of materials, from industrial plastics and soft metals to biological tissues - calcified and non-calcified. Uses any profile knife, including disposables in a suitable holder. Fully orientable clamp can be used directly on sample or to secure ancillary stages. Ideal for use with H/I CryoHistomat. Ideal for cutting a wide range of materials, including bone, plastics, resins and wood as well as large area soft tissue. The 8000 incorporates retraction on the return stroke, helping avoid possible damage to specimens. Freezing stages such as the CryoHistomat can be used in conjunction with the 8000 on occasions where it is necessary to freeze specimens while in a laboratory environment. 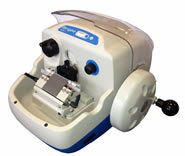 Portable and affordable, the H/I freezing microtome is designed for use with any model Cryo-Histomat. Accommodates 8-12cm knives; knife angle adjustable through 10 degrees. Detachable clamp for specimen or auxiliary stages. Continuous specimen feed for section 5 - 40 micrometers in increments of 5. Robust, cast construction for rigidity. Available with Closed Circuit Coolant System for operation with Cryo-Histomat remote from water supply. Making a radical leap forward in wax sectioning technology, the M3500QR incorporates a flat-cutting radial action. This has a distinct advantage over a vertical cutting microtome in that the specimen moves along the blade, as well as down on to it, this producing a slicing cut (similar to a guillotine). The cutting action produces less section compression than other methods and therefore gives superb results. Custom Dry Ice Stage available upon request.